When and how did your interest in bees and beekeeping begin? 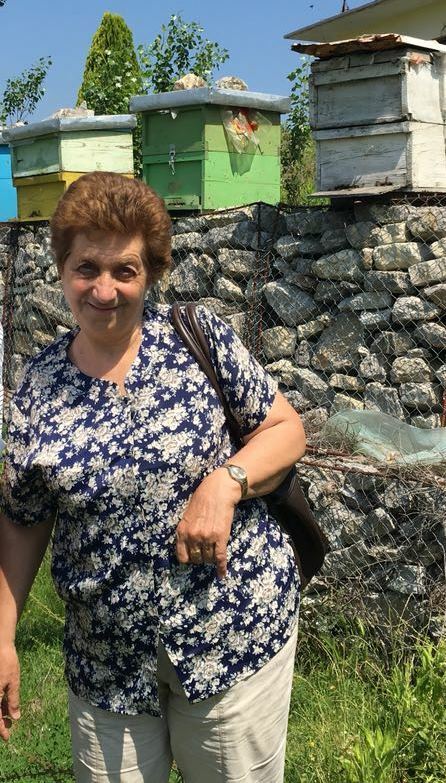 My involvement with bees started after I completed my studies: In 1981, I graduated in biochemistry from the Faculty of Natural Sciences and started working at the silk-producing center. The center included a lab which later became a part of the bee and silk department under the umbrella of the Zootechny Institute. When the department closed in 1996, I started working at the former Veterinary Research Institute (now Instituti i Sigurisë Ushqimore dhe Veterinare - ISUV) until 2006. It was in the lab, that I began working on issues relating to honey bees and bee health, especially on varroasis and others diseases but also analyses of honey, wax and propolis. Over the years, I got involved in many collaborations and projects on these issues where there was a need for our laboratory. In 1991, the Albanian Beekeepers Association was founded. It is based on different local associations. From 1991 till 2007, I was the General Secretary of the association. During that time I learned a lot from working with beekeepers and their wealth of experience, the exchange of information during trainings and visits to bee farms. Since 2007, I am the Chairperson of the Beekeepers Association. This task has not always been easy, especially in view of limited resources, investment capacities and government support and other difficulties that are present in the beekeeping sector. On the other hand, adressing these concerns has made me love my job even more so! Can you tell us what makes the Albanian honey so special? We have about 365,000 beehives in Albania and produce 3,200 to 3,400 tons of honey per year. Farmers in Albania breed the Apis mellifera Carnica which fits well in our context: The vegetation in Albania is Mediterranean and Mid-European and 2/3 of the territory is hilly or mountainous. From the western coasts to the eastern borders, the vegetation blooms from January to December. We have 350 hours sunlight in winter and 980 hours in summer. The two climate extremes are in November-January and July-August. Beekeeping takes place all over the country. Some bees 'graze' up to 1,000m - 1,500m and find a great variety of medicinal and aromatic plants growing on the mountain slopes: Sage, thyme, oregano, winter savory, clover, small-leaved lime and other herbs or plants as well as trees like the acacia, the strawberry tree or the chestnut help our bees produce high-quality honey. Albanian honey is mainly polyphlore and offers delicious varieties in all parts of the country, for example in Tropoja, Malsia e Madhe, Mirditë, Dibër, Pogradec, Erseke, Përmët, Tepelenë, Vlorë, Sarandë or the mountains of Librazhd! Also, the lack of industrial plant propagation often containing GMOs adds to the quality of our honey. 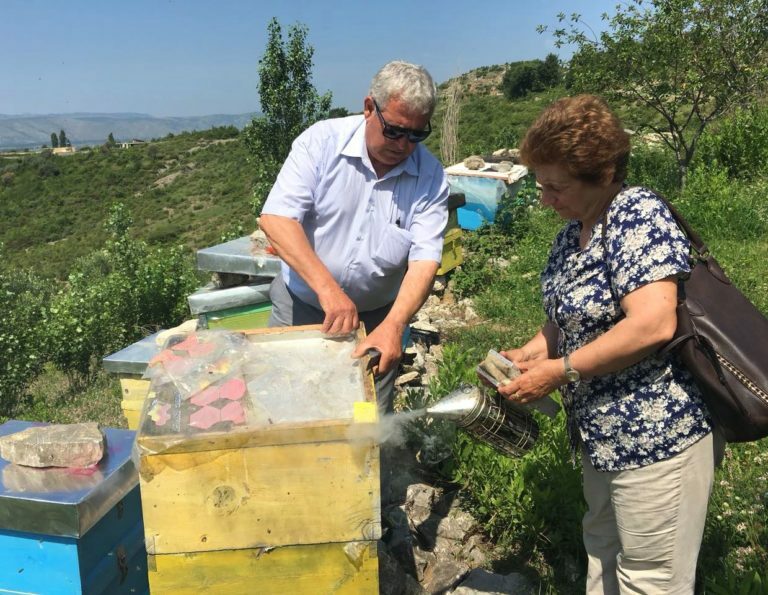 We notice that there is an increasing interest in honey production in Albania, which seems to continue in the years to come. But besides honey, Albanian beekeepers also produce royal jelly, which is in very high demand as well as propolis, pollen and wax. These bee products bring beekeepers increasingly an additional income and have been traditionally used as or included in medicines. What is your favourite home remedy using bee products? Since ancient times, honey is also used as a medication. Creams with honey support the healing of burns and wounds. Other ingredients I use in creams are wax and olive oil which together with propolis offer so many healing values. Propolis contains abundant flonoloids and is anti-mold, antibacterial and antiviral. The propolis creams I prepare help improve various health conditions such as eczema, psoriasis or wounds. The combination of wax, olive oil and Lule Basani (Saint John’s Wort) has positive effects not only on skin conditions but also problems such as hemorrhoids. Other creams are made with propylene glycol ingredients to substitute alcohol for those people who for example practice Traditional Chinese medicine. Thank you very much Lejla! More information on our Honey Trail, itineraries and booking details is available here. We will also be happy to plan your very own tailor-made Honey Trail experience for you!